Thanks to our friends at Jones Dairy Farm for sponsoring today’s post! 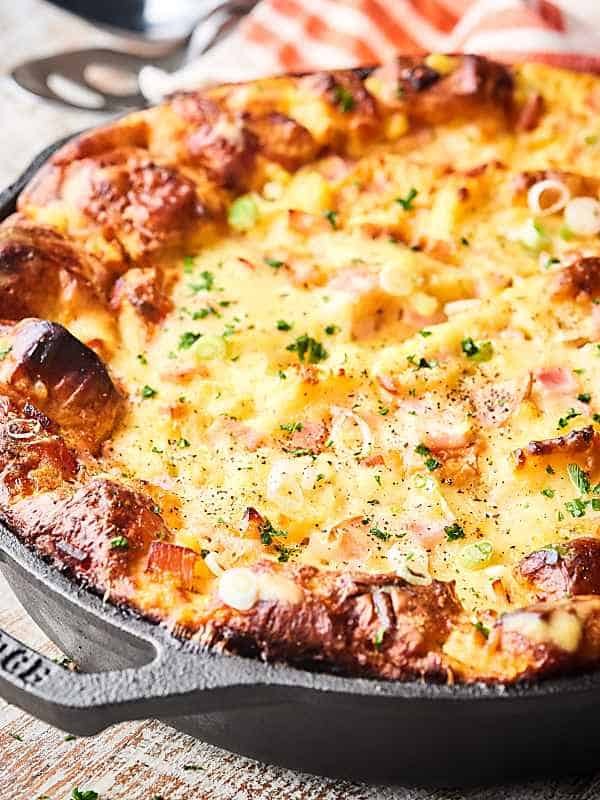 Think eggs benedict meets breakfast casserole meets sweet Hawaiian flavors. 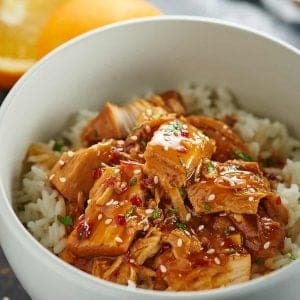 It’s really quick and easy to put together, it makes a ton, and it’s super delicious. It’s time for some brunchin’. Now. I LOVE brunch. I LOVE eggs benedict. I LOVE entertaining. But, those three things don’t necessary go hand in hand. 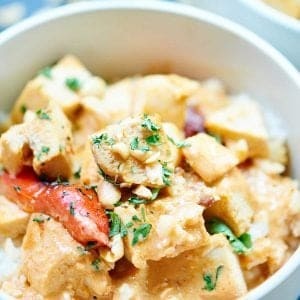 I want to enjoy my brunch and company without having to slave over the stove to prepare all my favorite brunch recipes. 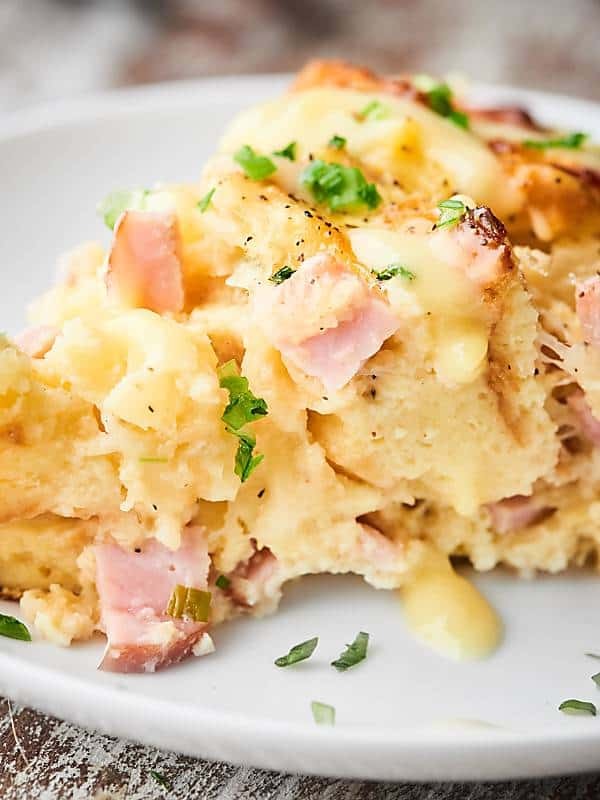 That’s why I came up with today’s recipe: Hawaiian Eggs Benedict Casserole. It starts with just a teeny touch of prep work: slice some green onions, shred some cheese, cube some sweet rolls, and dice some Jones Dairy Farm Canadian Bacon and pineapple. Now, in a VERY large bowl, whisk together some eggs, milk, salt, pepper, the sliced green onions, and shredded cheese until well combined. Then you’re going to stir in the Canadian bacon and pineapple. Lastly, you’ll gently fold in the cubed sweet rolls. Pour this mixture into a greased 10.25″ cast iron skillet (or 9×13 in baking dish) and bake until it’s golden, bubbly, and delicious. I mean, can we just talk about how EASY that was?! The result is a slightly sweet casserole which pairs beautifully with the salty Jones Dairy Farm Canadian Bacon. I LOVE using their Canadian Bacon in this recipe, because it’s certified gluten free with no preservatives or MSG! 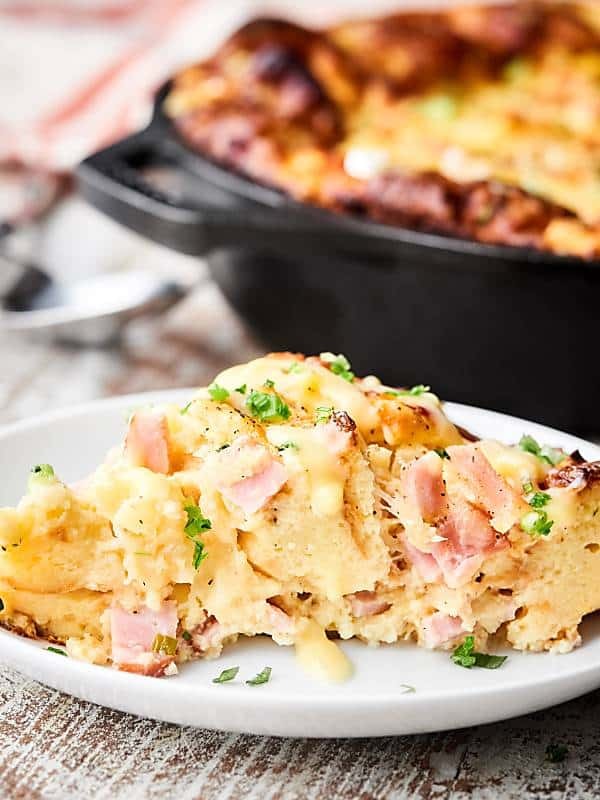 This Hawaiian Eggs Benedict Casserole is creamy, ultra cheesy, sweet, salty, and SO quick and easy to make. You ready to get your brunch on?! Get the full recipe on Jones Dairy Farm today! Thanks again to Jones Dairy Farm for sponsoring today’s post! This sounds rather scrumptious. Happy V-Day to you two! My husband’s favorite is eggs benedict! I love this Hawaiian version! Made your crustless quiche lorraine this past weekend! We loved it! Happy Valentine’s Day guys! The fact that the Canadian bacon is gluten free is a plus for us g-freers, but what do you use in place of the sweet rolls to make it a truly gluten free recipe? Ok, now that is just too easy! I love quick and easy brunch recipes like this! That ham and pineapple twist has me drooling! This is so different, but I love the sound of it! Perfect easy breakfast too! Love this! 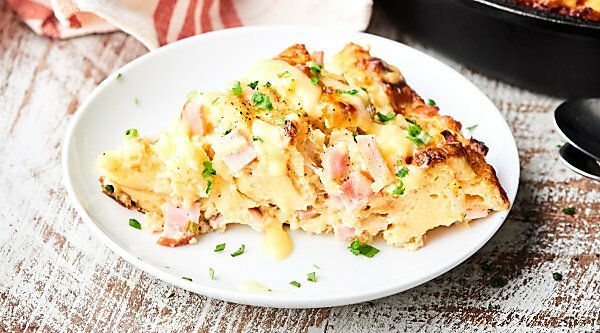 It’s like taking the pizza and putting it into a breakfast casserole. 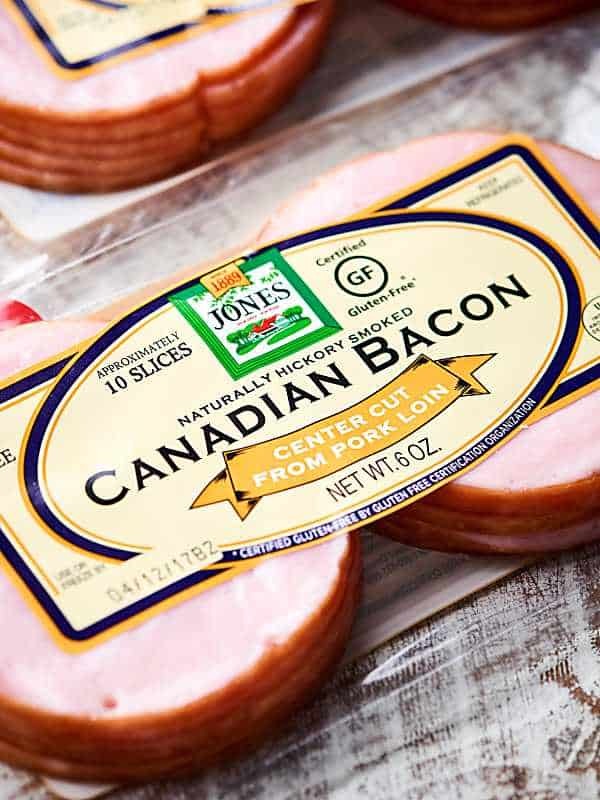 Jones’ Canadian bacon is one of my favorite breakfast meats. So lean but still delicious! It TOTALLY tastes like pizza! This looks amazing and we love Jones Dairy Farm Canadian Bacon!!! This is seriously my idea of the perfect breakfast/brunch! Since I’m Canadian I completely approve of the use of Canadian Bacon. It rocks. People need to eat WAY more of it. 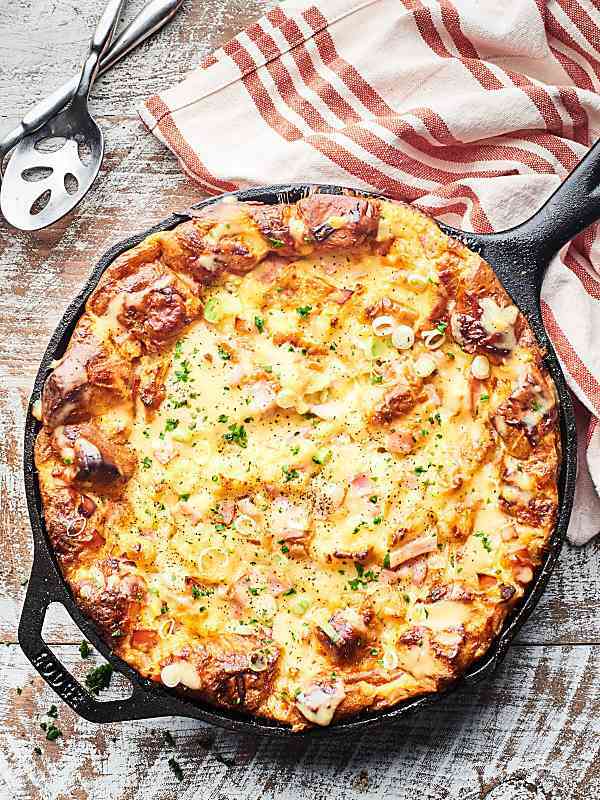 This is the prettiest breakfast casserole I’ve ever seen. It’s absolutely stunning. I would gobble this up so fast. Eggs Benedict is such a brunch classic, but I totally agree that it’s no fun to be cooking the whole time. Love this idea for guests!